Then Abimelech took sheep and oxen, and male servants and female servants, and gave them to Abraham, and returned Sarah his wife to him. And Abimelech said, "Behold, my land is before you; dwell where it pleases you." To Sarah he said, "Behold, I have given your brother a thousand pieces of silver. It is a sign of your innocence in the eyes of all who are with you, and before everyone you are vindicated." Then Abraham prayed to God, and God healed Abimelech, and also healed his wife and female slaves so that they bore children. For the Lord had closed all the wombs of the house of Abimelech because of Sarah, Abraham's wife. Abimelech was a common name among the kings of the Philistines, and the tribe living in Gebar might well have been one of their predecessors. At any rate, the name is some sort of Semetic dialect, part Hebrew and part something else. Nobody is positive what it means, although "my father was a king" and "my father is Molech" are two good guesses. Molech (or Moloch) was a particularly horrible heathen god. Worship of him required children to be burned alive in sacrifice. To the Jews and especially early Christians, the name Moloch became synonymous with "devil", one of Satan's evil minions. We have no information that Abimelech was unusually evil, but his interaction with God (Yahweh) is unusual. As so often happens in the Old Testament, God must bring physical suffering upon a heathen king in order to compel him to action. Here, God has not only spoken to Abimelech in a dream, telling him he would die if he did not give Sarah back; he has also caused the women of his household to become infertile. Unlike Pharaoh in the story of Moses, Abimelech comes into line quickly; he is impressed with the power of God. He not only gives Sarah back untouched, but also sets Abraham up with land, livestock and servants. 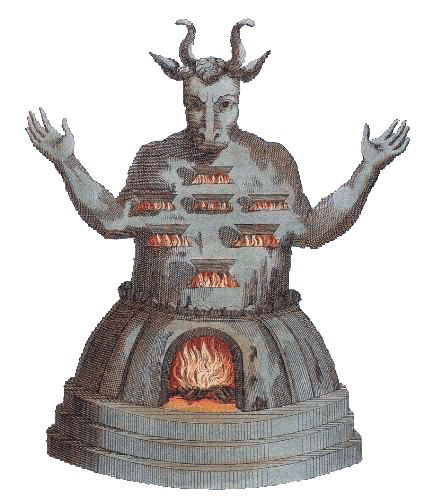 This depiction of an ancient statue of Moloch shows that he was hollow, with an oven inside for burning sacrifices. The fire would also cause it to glow red.